This delightful chime features a mermaid charm. Mermaids are the sirens of the sea. Using their breathtaking beauty and seductive charm, they enchant sailors and fishermen alike. 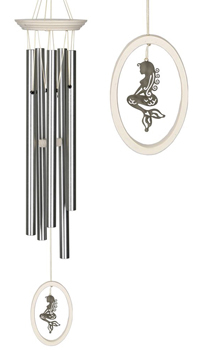 Our Wind Fantasy Chime's exotic song provides the music for your customers' dreams. Material: White wash finish ash wood, 5 silver tubes, nickel-plated brass ornament.